However, Christmas is that time of the year when all kind of things can happen. So if you, just like Collman Lloyd that had a rather disturbing conversation with the US president, would still leave milk and cookies on the coffee table for Santa, there was still a chance that you wouldn’t like the gifts you received this time around. This has been particularly true of the present that Santa-Trump decided to make to the US Armed Forces, as he decided for the first time in his presidency to pay a visit to US servicemen operating in Iraq. Together his wife Melania, Trump sneaked aboard the Air Force One that had all lights turned off and curtains closed until the take off. This flight took them to the Al Asad Airbase some 120 miles from Baghdad, where Trump wanted to wish those sacrificing their lives for Washington’s super profits a Merry Christmas. This trip was mired so hard in secrecy that even the journalists that were accompanying the US president wouldn’t be able to report the news two hours after the landing. It goes without saying that all the diplomatic procedures that must be observed when a leader of foreign state visits a country were simply ignored by the White House, which constitutes a serious insult to Iraqi authorities. A flagrant and clear violation of diplomatic norms that shows his disdain and hostility in his dealings with the Iraqi government. Therefore, one can hardly be surprised that the absolute majority of Iraqi lawmakers respond to this Christmas visit with demands to initiate a complete and immediate withdrawal of American troops from the Republic of Iraq. Local anti-government forces seemed to be equally outraged by this visit, as mortar shells started landing in the immediate vicinity of the US embassy in Baghdad once it became known that Trump chose to ignore all of the diplomatic procedures. Thankfully, nobody got injured or killed in the course of those attacks. Among the gifts that Santa-Trump left in your sock one can also find the decision to terminate the illegal occupation of Syria by the Pentagon, that was initiated in direct violation of all international norms. According to various reports, this announcement hit Washington like a bombshell, wreaking havoc and panic among American elites. It’s been said that a massive column of black smoke can be observed near the Rukban refugee camp that is situated in the immediate vicinity of the Al-Tanf US military base. There are reasonable suspicions that the members of the so-called US-led coalition are trying to get rid of the bodies of refugees who died of starvation and disease in the absence of any assistance of the US armed forces. Experts agree that the grim legacy of American occupation of Syria will be haunting Damascus and a number of international human rights organizations for years to come. However, if Trump used to win praise from the American Israel Public Affairs Committee, the powerful pro-Israel lobby group, and from other groups supportive of the Israeli government, for his decision to relocate the US Embassy in Israel from Tel Aviv to Jerusalem. He won similar accolades for his decision to withdraw the United States from the Iran nuclear deal. His administration’s voting record on issues related to Israel and the Middle East in the United Nations also won praise. 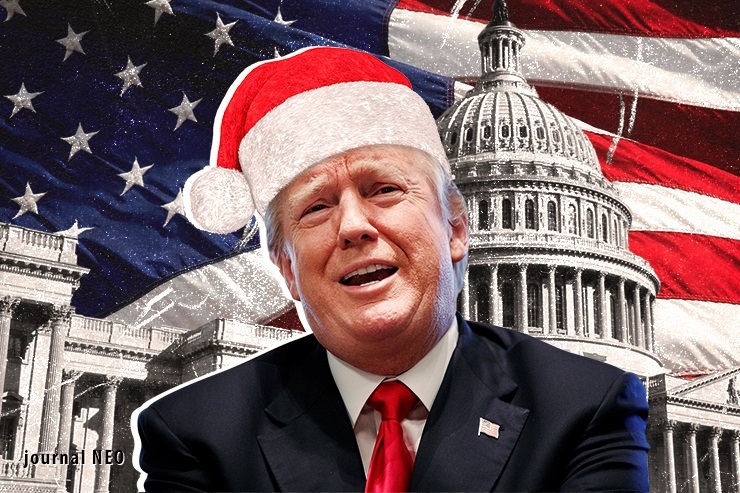 However, the Christmas souvenir in the form of the US withdrawal from Syria resulted in the majority of pro-Israeli organizations turning their back on Santa-Trump. And even if it’s hard to argue with the sitting US president as Washington wasted 8 trillion dollars over the last two decades on overseas military operations, with the absolute majority of these reaping disastrous results, it’s unlikely that the so-called Deep State is going to take this withdrawal lightly. And even if this mind-boggling amount of money could be spent on supporting the poor, the globalist elites have their eyes fixed on preserving American primacy. According to Turkey’s Sabah, if Trump manages to overcome the resistance of those warmongers that have been dominating the US politics for the last three decades, he will be presented with an opportunity to ensure the well-being of the American people. If the policies of former American presidents US foreign policy was aimed at policing the rest of the world in complete disregard of the international norms, from the point of view of Trump the businessman, all of this is bad for investments. Therefore, the statement that Trump made in Iraq on Christmas Eve about the US abandoning the role of a world gendarme is clearly a reflection of his views on the world politics and the role America plays in it. The sad truth that this gift to peace that Santa-Trump presented to the world is not going to sit well with the US and NATO hawks, that is why it’s safe to say that storm is looming over the horizon. And the hounds have already been let loose. Thus, there’s been all sorts of allegations voiced by the Western media that the sitting US president managed to somehow reveal an allegedly top-secret fact that US Navy Seals were deployed to Iraq by taking a video with operatives in full combat gear wearing night vision goggles. Evil tongues say that Trump violated the protocol, according to which the locations of US special forces units should not be revealed. According to the Washington Post, pretty much everyone who contacted Trump over the last decades or had business dealings with him is now under the investigation of the US law enforcement agencies. So this year is going to be pretty turbulent both for the world, the US and Santa-Trump himself.